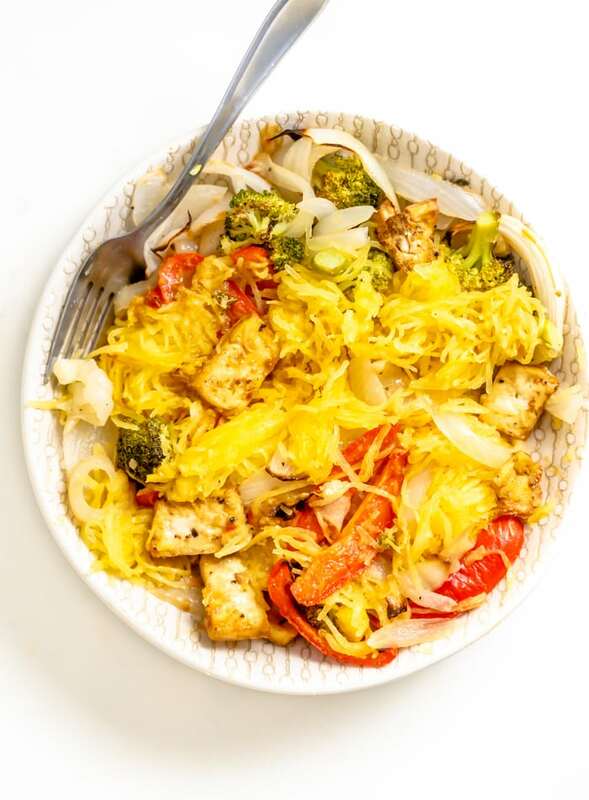 This Thai-inspired sheet pan recipe for Easy Vegan Spaghetti Squash Noodles with Veggies and Tofu is simple to make, full of flavour and packed with nutrition. There are a few different methods for cooking spaghetti squash. It can be cooked in the oven, microwave or even steamed. I like to cook spaghetti squash in the oven, face up, at a high temperature. I find cooking it face up rather than cut side down yields a better final result. 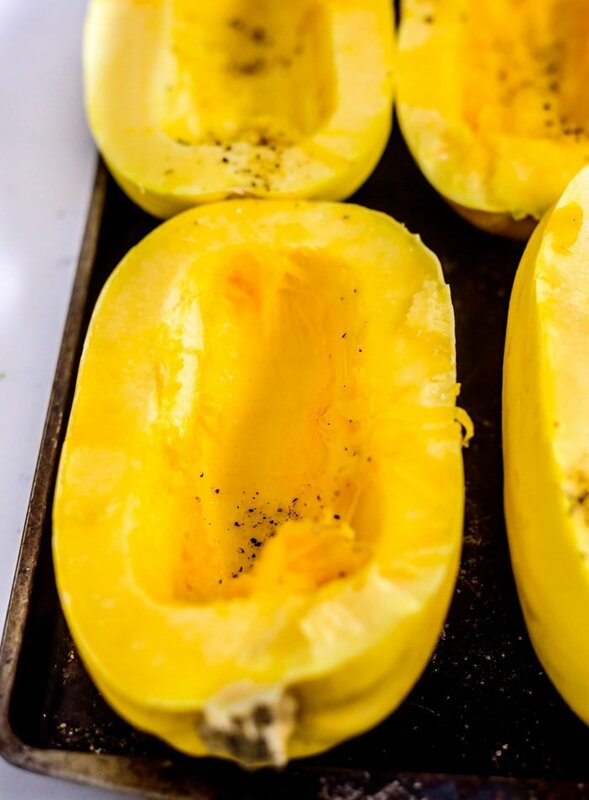 For this recipe, cut your spaghetti squash in half, scoop out the seeds, place the squash cut side up on a baking tray and roast in the oven at 450 degrees F until you can pierce the flesh with a fork. Once the squash is cooked, remove it from the oven and let it cool for a few minutes. Once you can handle it, drag a fork through the flesh to create spaghetti squash noodles. More details on cooking spaghetti squash here. I used bell pepper, broccoli and onion but you can customize the veggies to your preference or to what you have on hand. Some other veggies that would work are carrot, zucchini, snap peas, snow peas, brussel sprouts or mushrooms. you can also mix some fresh spinach or kale into the cooked veggies if you want to add some extra greens. As for the cooking method, went with roasted veggies so I could have them cooking in the oven at the same time as the squash. The browned and slightly crisped texture you get with roasting is also really yummy. If you prefer, you can do steamed or stir-fried veggies. You could also take it a different direction and use tahini sauce for more of a Mediterranean dish. If you go that route, try adding some olives and parsley for extra flavour. The recipe calls for tofu but I’ve also made this with chickpeas, lentils, edamame and tempeh so feel free to switch it up. If you prefer to use tempeh, follow the same method as listed for the tofu. If you’re using chickpeas, lentils, edamame or another bean, simply mix the cooked beans into the final dish. I baked the tofu in the oven at the same time as the squash and veggies to make this a complete sheet pan dinner. Okay, so I needed 3 sheet pans but still – roasting everything in the oven at the time is a breeze and makes for less clean up, which is always a win. If you prefer, you can brown the tofu in a hot skillet using the “dry-fry” method. Simply add the cubed or sliced tofu to a hot, non-stick pan and cook until brown and crispy, shaking the pan often. For more information on getting protein in a plant-based diet, read my guide to the best vegan protein sources. 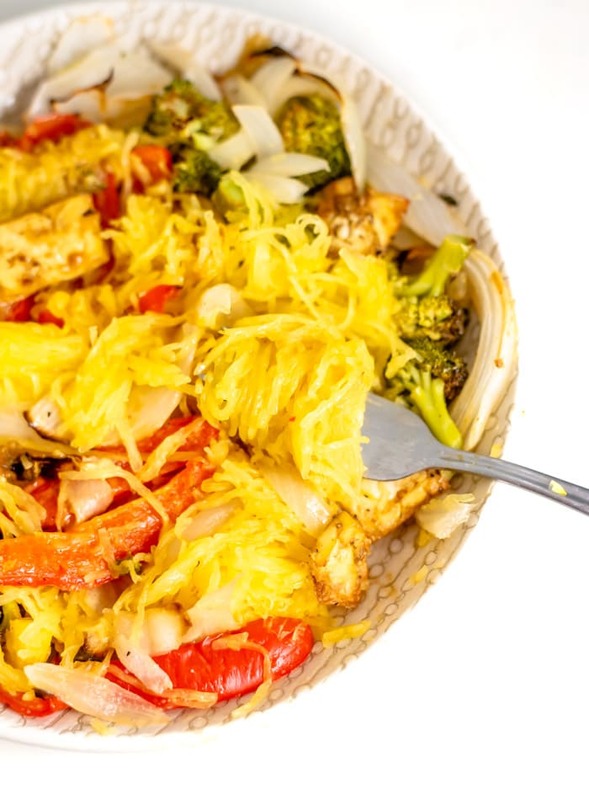 This delicious, Thai-inspired, noodly spaghetti squash recipe is easy to put together, a great recipe for beginner plant-based eaters and a good option for a meal prep recipe. The squash, veggies and tofu can all be baked in the oven at the same time. While they’re cooking, whisk together the sauce. Once everything is done cooking, mix it all up, add the sauce and you’re done. This recipe is very flexible. 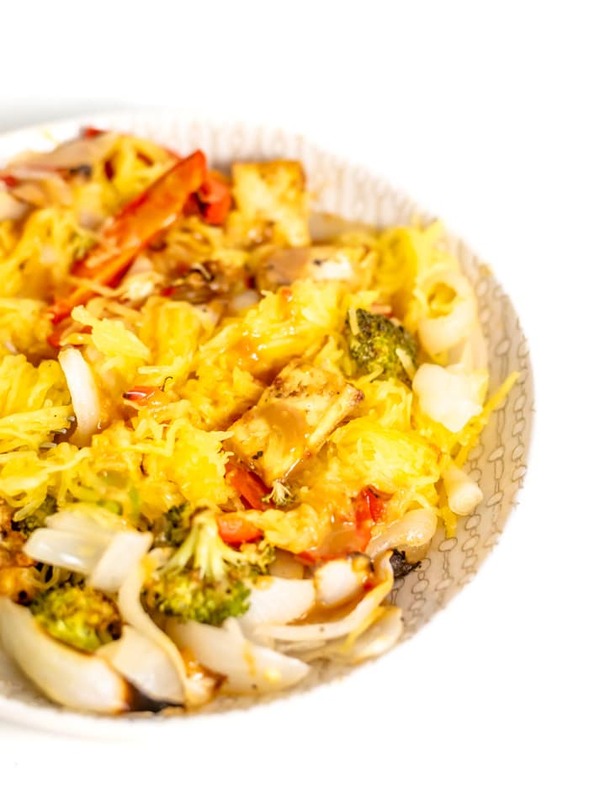 Use the suggestions for alternative sauces, veggies and protein to make it your own or follow the recipe below for a healthy, easy and delicious alternative to a traditional Thai peanut noodle dish. To meal prep this dish. Cook the squash and veggies then divide the noodled spaghetti squash and cooked veggies into 4 containers. Whisk up the sauce and store in a separate container to add as close as possible to when you’ll be eating the dish. 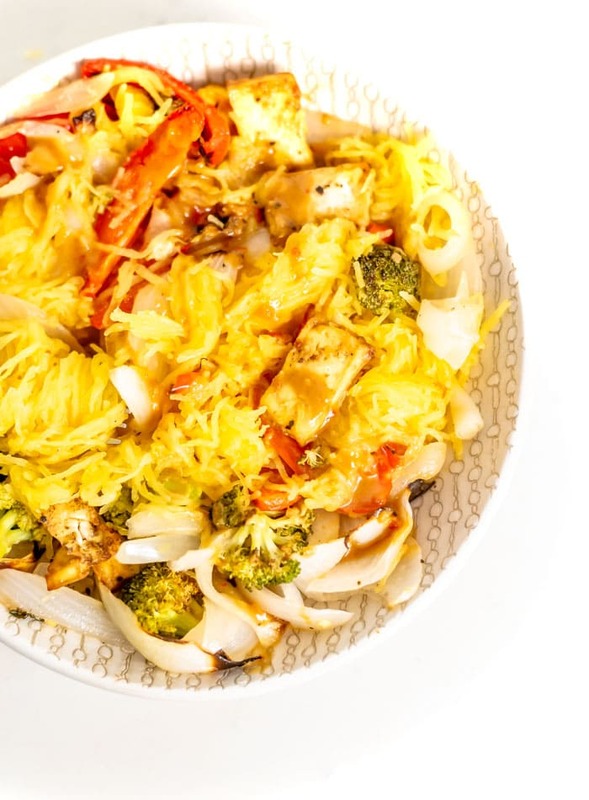 This delicious, noodly spaghetti squash features roasted veggies, crispy tofu and almond satay sauce for a Thai-inspired dish everyone will love. It’s easy to make, keeps well, vegan, low carb and gluten-free. Turn the oven on to 450 F.
To make the spaghetti squash, cut in half, scoop out the seeds and place face up on a baking tray. Roast in the oven for approximately 30-40 minutes until you can pierce the flesh with a fork and the squash easily peels away from the skin. Once it’s cooked, remove from the oven, let it cool a bit until you can handle it, then drag a fork across the squash to create noodles. Spend a few minutes, scraping out all the squash into noodles. 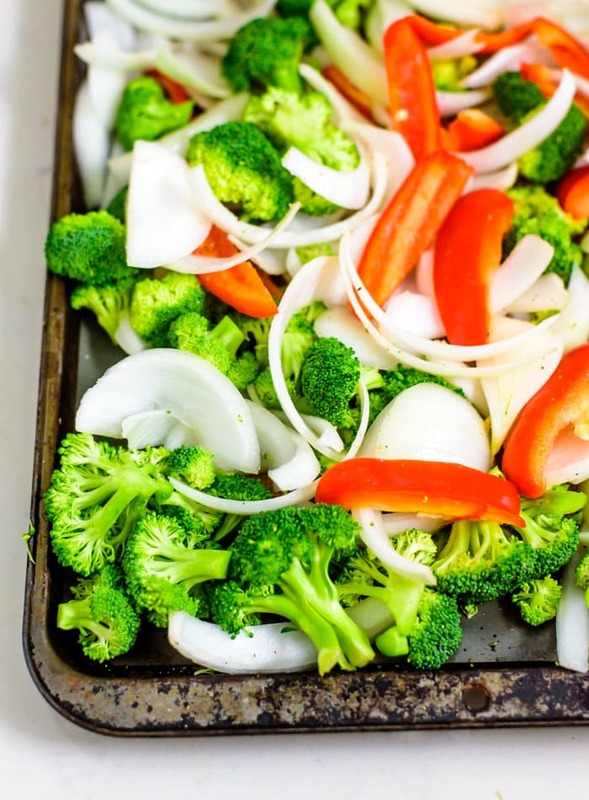 To make the roasted veggies, place on a baking tray, toss with 1 tsp of oil and sprinkle with salt, pepper and garlic powder. Roast in the oven at the same time as the squash for approximately 30 minutes until tender and browned. To make the tofu, cube and toss with a splash of soy sauce, a generous amount of black pepper, a pinch of garlic powder and the optional cornstarch or arrowroot powder. Either place on a baking tray and bake in the oven with the veggies and squash for about 30-40 minutes until browned and crispy. To make the sauce, vigorously whisk the ingredients together until smooth and creamy. To assemble, either scoop the spaghetti squash noodles into a bowl and top with the tofu and sauce or for a fun serving idea, create a spaghetti squash boat by piling everything into the noodled spaghetti squash, using the squash itself as a bowl. Serve with fresh cilantro, if desired. I made this recipe and it’s delicious and satisfying! You’ve inspired me to try more of this kind of meal with spaghetti squash. Oh yay, so glad to hear it! So easy right! I’m glad you liked it. 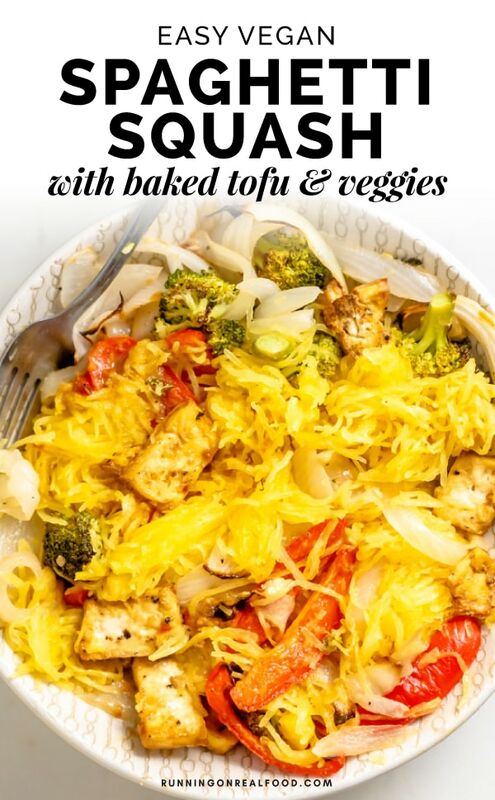 I love keeping spaghetti squash on hand for simple meals like this. Dinner tonight! Two helpings it was that good! Thanks. That’s awesome. So glad you enjoyed it! Thnks for the rating.